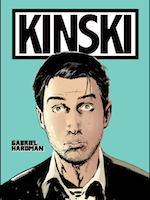 At the opposite end of the digital comics spectrum to the Madefire’s motion comics bombast are the delightful monochrome musings of MonkeyBrain’s Kinksi and Masks and Mobsters, both of which have new issues out this new via ComiXology. Although completely different in form and content, it serves as a fantastic reminder of the broad nature of what makes a digital comic. Gabriel Hardman’s dog rescue/adventure story Kinski is so delightfully low-fi you want it to smell of news print and leave ink smudges on your fingers. It’s story is simple – a man finds a lost dog and rescues it from supposed mis-treatment and adventures ensue. Fortunately this isn’t the kind of twee ‘one man and his dog’ adventuring of The Littlest Hobo or that ilk, instead its a really simple and charming indie-spirited book that avoids mawkish sentimentality yet retains a real emotional heart with its incredibly grounded, real-world story. In this new instalment our hero Joe chooses to drive across country rather than stow Kinski in an airplane hold and as is always the way on a road trip he discovers some important facts about his new pet when he meets a beautiful barmaid called Holly, who has a connection to Kinski in more ways than one. In a medium overrun with superheroes and gritty futuristic crime dramas, Kinski stands out for its subtle charm and simple ideas. Hardman’s use of a tightly structured 6 panel grid works brilliantly on the iPad’s screen while the simple black and white pen and ink artwork gives the book a timeless look and feel that will not be affected by the whim of current trends. Meanwhile in Masks and Mobsters, we are treated to another dip into the world of pulp superheroes and wise guys. 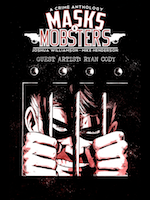 This time focussing around the interrogation of golden age hero Tri-Star about his involvement in the murder of a leading mobster as well as revealing more about the death of Tri-Star’s s partner Dr Daylight. Joshua Williamson is without regular art partner Mike Henderson on this one but is ably assisted by guest artist Ryan Cody whose grasp of M&M’s monochrome style does not disappoint. If anything the fact that M&M’s continuity is much broader than issue to issue means artists can come and go without it disrupting the flow of the book, which is great for readers, although not necessarily great for Henderson! For issue 8, Williamson and Cody manage to create superbly tense interrogation scene, which often feel like something out of Powers. However, rather than feeling like a cheap knock-off, Henderson manages to ‘out-Powers’ Bendis and Oeming by writing the kind of brilliant, dialogue rich, one location story that used to be a stand out in their early issues. Complete with flashbacks to World War Two action that instantly evokes the world of Mike Mignola, not only because the main protagonist has big horns, Masks and Mobsters #8 is another fantastic addition to the series. Sure, the characters are archetypes with the police chief rocking a Jim Gordon moustache and glasses combo and hero Tri-Star looking a bit too much like Watchmen’s Comedian, but that is half of the charm, as these are the kind of stories you wish were being told by the Bog Two. Both titles are available for the bargain price of 69p/99¢ and in doing so MonkeyBrain once again remind us that there is more to digital comics than flashy transitions and slick graphics. Great stories and great art will always make for great comics, no matter the format.